“Medicine, Ministry, Miracles: One Neurosurgeon's Life” from Christian Faith Publishing author Rev. Phillip Goldfedder, M.D. is the story of a man whose desire to help others compelled him to become a neurosurgeon. After witnessing the power of faith to heal, Dr. Goldfedder answered the call of God and became a minister to those in of God’s healing touch. “Medicine, Ministry, Miracles: One Neurosurgeon's Life”: the story of a man whose life was forever changed after his pain was healed with faith. “Medicine, Ministry, Miracles: One Neurosurgeon's Life” is the creation of published author, Rev. Phillip Goldfedder, M.D., a neurosurgeon of thirty-seven years and minister of the gospel who studied under Charles and Frances Hunter. During his time as a neurosurgeon, he met, fell in love with, and married a beautiful nurse named Maureen. “The greatest secret to unlocking God’s abounding grace, as well as the key to the Lord’s abundant blessings, is found simply in giving. When you give, you exercise both the answer and the solution to everything. The greatest principle here is that your love gives God’s love, and this represents the foremost of all the attributes of His person and His personality. His love mandates that those who are born into His family will learn to duplicate His same passion and compassion.” --Rev. Phillip Goldfedder, M.D. Published by Christian Faith Publishing, Rev. Phillip Goldfedder, M.D.’s new book shares a life of being a neurosurgeon for 37 years. For most of his life, he avoided spirituality in all forms. As time went on, however, he began to suffer from intractable pain in both of his feet. After he was miraculously healed at a church in Orlando, he dedicated his life to Christ. He soon realized that people could be healed through the power of the Holy Spirit, if he placed his hands upon them and prayed for them. He discovered that more people were healed through this supernatural means than were ever healed with the scalpel. Rev. Phillip Goldfedder, M.D. came to understand he was being called to become a minister of the gospel. He began his studies under Charles and Frances Hunter. He read hundreds of books about healing and Christianity. He witnessed countless healings and deliverances that he would have found difficult to accept as a secular surgeon. Healing through Jesus is now the primary focus of his life. Since the transformation of his life, Rev. Phillip Goldfedder, M.D.’s goal has been to help others get to know the Great Physician who is the Healer of souls and bodies. View a synopsis of “Medicine, Ministry, Miracles: One Neurosurgeon's Life” on YouTube. Consumers can purchase“Medicine, Ministry, Miracles: One Neurosurgeon's Life” at traditional brick & mortar bookstores, or online at Amazon.com, Apple iTunes store, or Barnes and Noble. 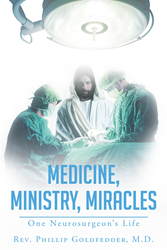 For additional information or inquiries about “Medicine, Ministry, Miracles: One Neurosurgeon's Life”, contact the Christian Faith Publishing media department at 866-554-0919.